As the name implies this brooch was inspired by the shape of a pillow. The body of the brooch is shallow formed and highly polished. The little 'pillows', also shallow-formed in silver, are matt finished, oxidised and attached to the body of the brooch with polished 9ct gold rivets. 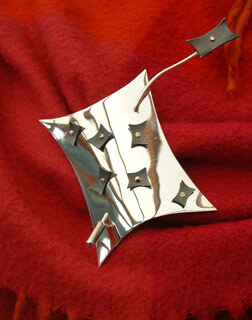 The brooch is secured in place by a silver pin that weaves through the brooch and is fitted with a safety stopper.